Ah this picture makes me so happy! 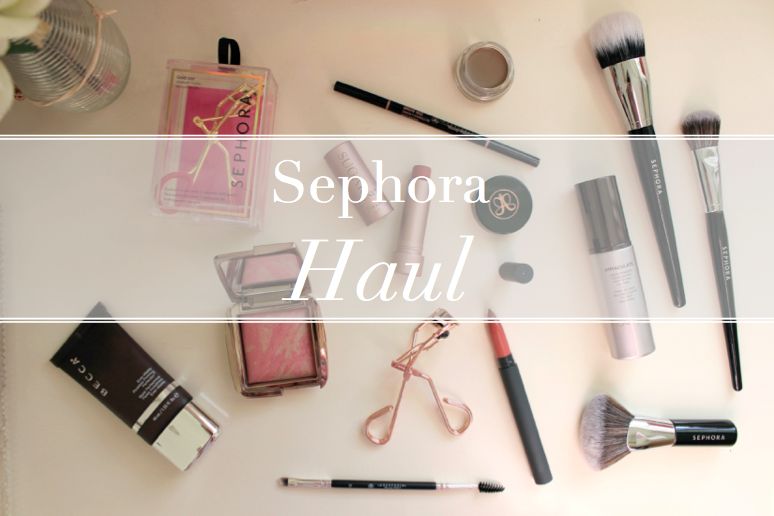 There’s something about letting yourself go a little bit crazy in Sephora that gives you a little bounce in your step all the way home (to London), and this was one heck of a bounce let me tell you that! I mentioned in my This Week I’ve Been post that this haul was to celebrate a promotion at work, so it felt justified… But lets face it, I was going to do a haul anyway! A few of these products had been on my wishlist for a while, like the Anastasia Brow products, and the Hourglass Blusher, but a few just caught my eye and I couldn’t resist! Let’s start with the base. 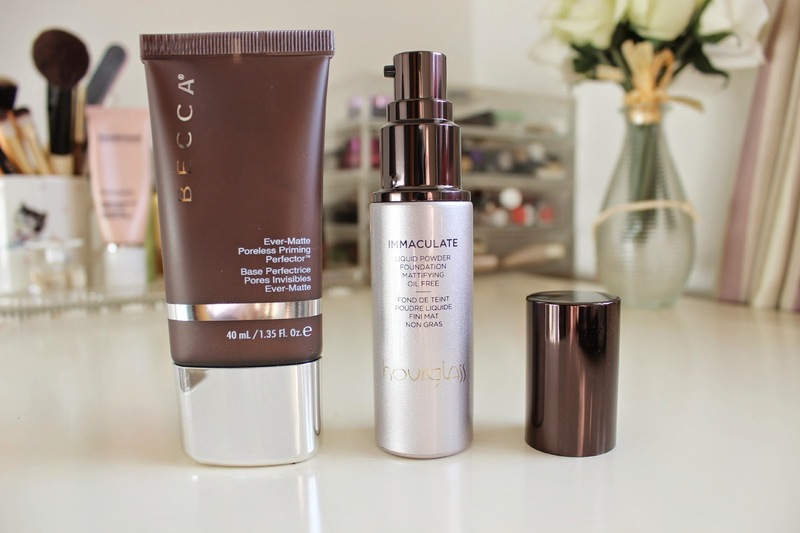 At the end of the aisles, Sephora displays their favourite products, and under the primer section the Becca Ever Matte Poreless Priming Perfector was hailed as the greatest for oily skin. Now for those of you who may not have visited New York, I should start by saying that the city seems to make your pores clog up as soon as you get off the plane, meaning I’m always more oily there than anywhere else. So this for me was like doing a supermarket shop when you’re hungry. I don’t have excessively oily skin in the UK, but taking a look in the mirror in the Sephora store, I decided this was the primer that I needed! I also chose the Hourglass Immaculate Liquid Powder Foundation, because it sounded too good to be true so I just had to try it out! A liquid to powder foundation which absorbs oil, camouflages imperfections and gives a long lasting velvet-matte finish, the foundation still retains skins natural moisture and contains pigments which catch the light so that coverage doesn’t look cakey or mask-like. All these claims sound like they could solve all my skincare concerns, so I can’t wait to put this to the test! 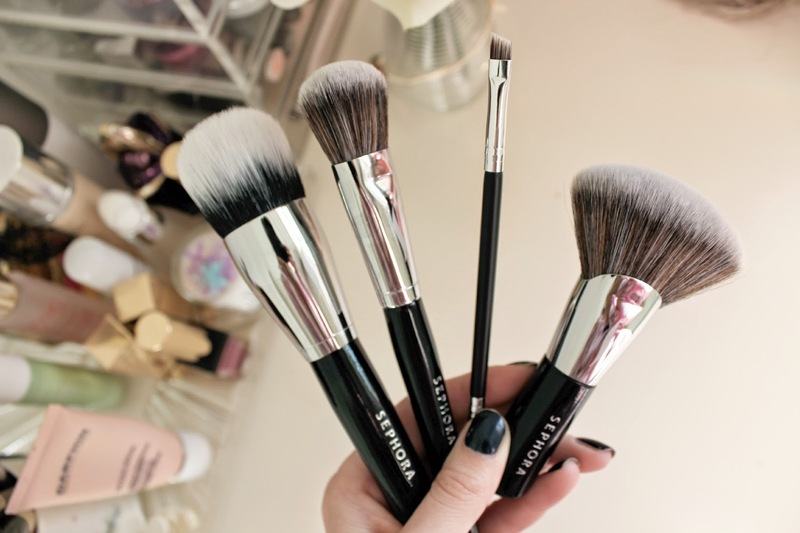 Ooh the brushes! I wasn’t actually planning on purchasing any brushes because I recently ordered (finally!) the Zoeva Rose Gold Brush Set. But you know how they are just all laid out so beautifully…. and the lady was telling me how much I needed them in my life….. I caved in, but I have no regrets! The first brush is the Sephora Collection Pro Large Domed Stippling Brush #41, it reminded me a little of the Kevin Aucoin brush which is just far beyond my budget, but looked to be of great quality. Made of natural and synthetic fibres, you ‘dab’ on your foundation to create a sheer, even application. Until now, I’d always used a Mac 187 for applying foundation, but I’ve found recently that I want to achieve slightly more coverage, so I also picked up the Pro Flawless Airbrush #56, which is made of synthetic fibres which are tightly compacted which makes it ideal for building up coverage. I also picked up the Anastasia dual sided brow brush. 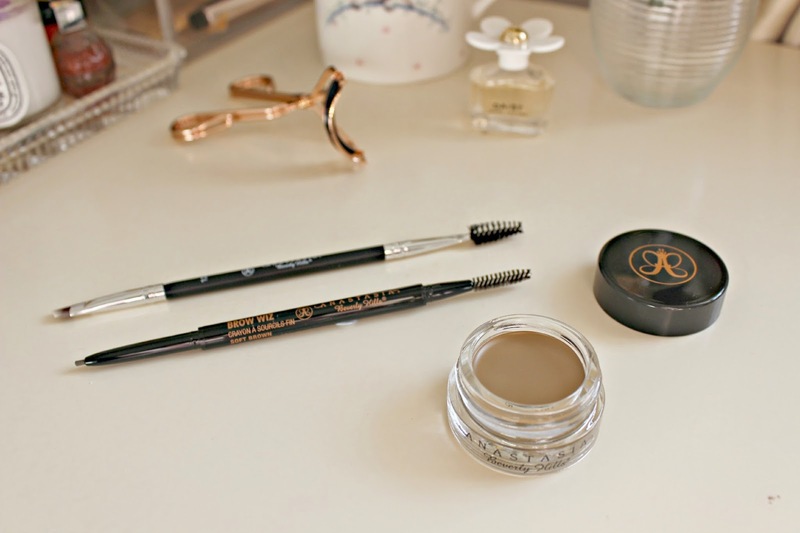 With both tools needed for brow grooming, the angled cut brush seemed thinner than any other I’d tried, and I thought it would be perfect to use with my new brow products! Finally, the Pro Full Coverage Airbrush #53, a very unusual foundation brush famed for creating a flawless ‘no makeup’ makeup look. I’m intrigued to try this as I’ve never applied makeup with a brush this shape before, I’ll let you know how it goes! 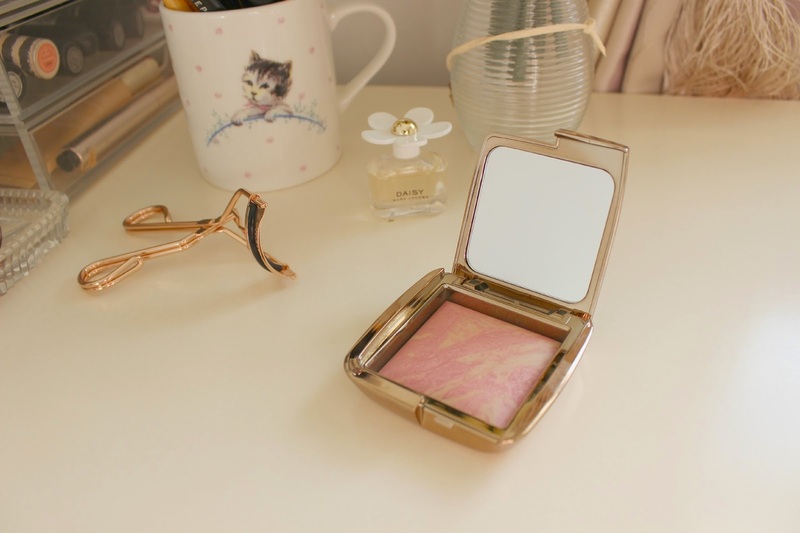 Ah, the Hourglass Ambient Lighting Blush! One of the only products that I’d actually intended on purchasing! I loved using my Ambient Lighting Powder last year, and as soon as I saw the blush which combines the lighting effects of that, with a beautiful blush hue, I knew we were destined to be together. It is a stunning product, and the blush gives a soft-focus, shimmering colour. I’ve been using this over my new Hourglass foundation, and I’ve already found a dream combination – so this will no doubt be featured in lots of upcoming posts! Next, a couple of lip products! I first noticed the Fresh lip balms when I visited in October, but didn’t pick one up because I have way too many balms. But I just couldn’t stop thinking about them, and then when one popped up on my instagram feed (blaming you Gh0stparties!) it sealed the deal. 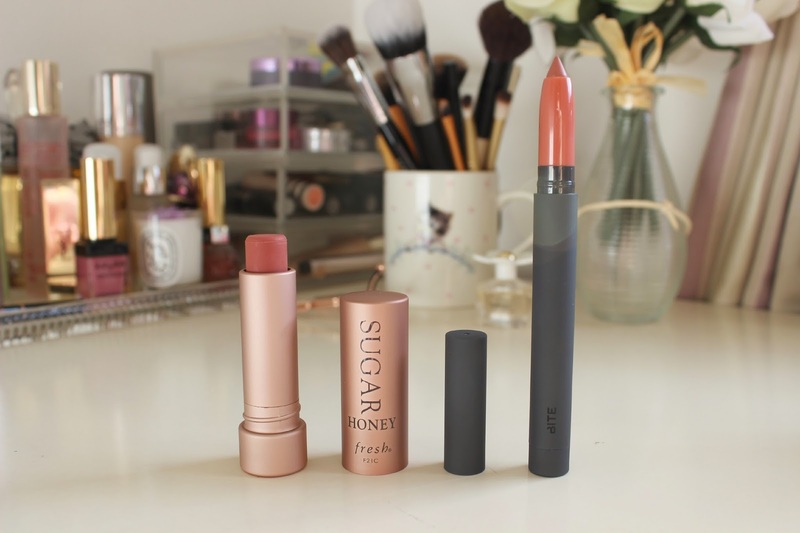 The only tough choice was which one to pick up, but I went for the Sugar Lip Treatment in Honey. It’s everything you want in a lip balm in that it hydrates and protects, it’s SPF15 and contains protection from wrinkle-causing free radicals. What makes it stand out for me though is the stunning shade – an orangey, browny pink which is like an easier-to-wear version of my Bobbi Brown Lip Crayon in Rosewood – I’ve worn it lots already and the compliments keep coming in! I also picked up a Bite Beauty Matte Creme Lip Crayon, after hearing promises of long wearing, water resistant colours. Their colour range was incredible, there must have been at least 20 to choose from, but the shade I loved the most was Glace, a dusty mauve shade not dissimilar to the Fresh balm. I haven’t tried it yet, but again will keep you posted! I’m more cautious to try the Brow Pomade. While the shade is perfect, and it’s famed for being great on oiler skin tones, I worry the formula may be a little thick and heavy due to its creamy consistency. I’m determined to make it work though, so I’m going to give this one some time. 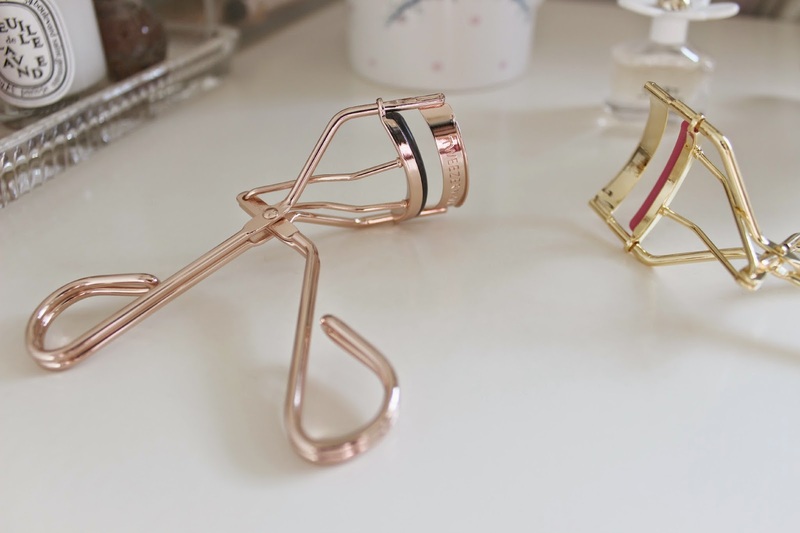 Last, but absolutely not least, eyelash curlers! I’m the first to admit that buying two sets is very excessive, but actually, I bought the Tweezerman ones (rose gold, left) in the Birchbox store (that’s another story!) because, well, they’re pretty. I mean, Rose Gold eyelash curlers?!! How’s a gal like me supposed to say no to that?! I can confirm that they work well too 🙂 As for the non-rose gold set, with the pink cushion pads, I bought them without a second thought really because they were reduced in Sephora, and they were pink and gold. Need I say more? Wow, so that’s my haul! I feel like throughout this post I’ve been justifying my massive splurge… when really it is just a bit excessive but I haven’t actually treated myself to a beauty haul in…. well ever maybe. I pick up a few fabulous pieces every now and then but I don’t think I’ve ever done a ‘haul’ before. I’d love to know what you think of the goodies I picked up, if you own any of these, or if you have any of your own Sephora recommendations!